Approximately 34 million Americans suffer from some variation of temporomandibular disorder (TMD) which is about 12% of the total population. It is a set of conditions that take place at the joint where the lower jaw meets the skull and causes pain and inflammation around the joint for the sufferer. While there are many causes known and unknown of TMD, stud­ies have indicated a close connection with sleep apnea. One such study discovered that 1/3 of their TMD patients undergoing polysomnography suffered from obstructive sleep apnea. Conversely, another study found that 75% of subjects diagnosed with sleep apnea had chronic pain indicators associated with TMD; it was concluded in this study that, given the high incidence rate between sleep apnea and TMD, patients with a sleep apnea diagnosis being fitted for an oral appliance be screened for TMD. There is some speculation as to why this connection has been mostly overlooked but one of the most apparent is the extreme difference in the typical sufferer of TMD and sleep apnea. TMD is most prominently diagnosed in females during the ages of 20 to 40; Sleep apnea is primarily diagnosed in older men. This dis­crepancy could result in many individuals not being screened for both and suggestive of a lower overall co-morbid prevalence rate. Potentially, both TMD and sleep apnea may be treated with an oral appliance. 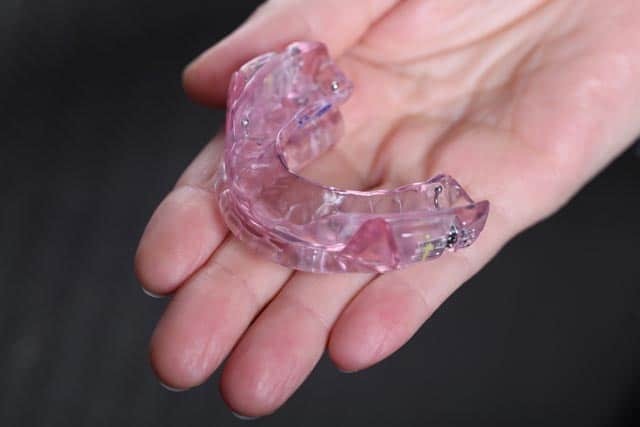 They have been shown to effectively reduce ap­nea events to safe levels and have been shown to have a higher rate of compliance among sleep apnea sufferers. 1. See WebMD’s Temporomandibular Joint Disorders (TMJ): Symptoms, Treatment, and More. 2. Cowley Jr., A. W., Bradley, T. D., Dubner, R., English, A., Maixner, W., Quan, S.F.,…White, D.P. (2001). CARDIOVASCULAR AND SLEEP-RE­LATED CONSEQUENCES OF TEMPOROMANDIBULAR DISORDERS. 3. Smith, M.T., Wickwire, E.M., Grace, E.G., Edwards, R.R., Buenaver, L.F., Peterson, S.,…Haythornthwaite, J.A. (2009). Sleep Disorders and their Association with Laboratory Pain Sensitivity in Temporomandibular Joint Disorder. SLEEP, 32(6): 779-790. 4. Cunali, P.A., Almeida F.R., Santos, C.D., Valdrighi, N.Y., Nascimento, L.S., Dal’Fabbro, C., Tufik, S., Bittencourt, L.R. (2009). Prevalence of temporomandibular disorders in obstructive sleep apnea patients referred for oral appliance therapy. J Orofac Pain, 23(4):339-44. 5. TMD; Temporomandibular joint disorders; Temporomandibular muscle disorders.